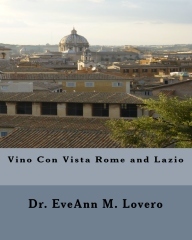 If you follow my posts, you know that I wax poetic about my love for Italy; especially Rome! Where else can you witness 28 centuries of history? I adore Rome’s monumental fountains, so I have included some short video clips of the water features in this post. The glorious city of Rome is adorned with spectacular fountains. Some are relatively simple and look like bathtubs as you can see in the picture of Fontana di Piazza Farnese that is located in front of the Palazzo Farnese. The granite stone basin of that fountain came from the Roman Baths of Caracalla. The emblems on the upper part of the fountain represent the Farnese family and the the man who commissioned the construction of the Palazzo Farnese; Cardinal Alessandro Farnese who eventually became Pope Paul III. Many of the fountains depict the person responsible for the commission. Some fountains support obelisks and others anchor famous piazzas. 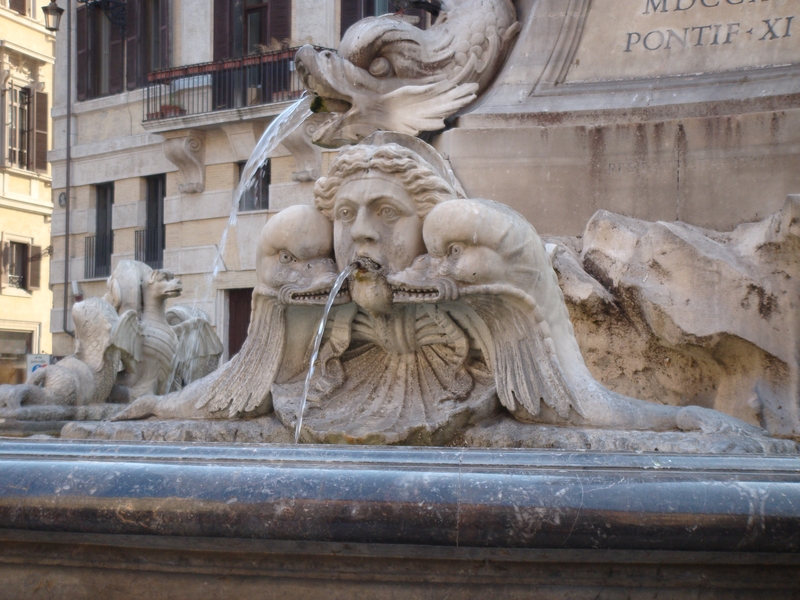 The dramatic iconographic fountains host a cast of interesting characters that generally spew water from their mouths. The basins are shaped in the form of chalices and decorative elements generally include dolphins, tritons, theatrical masks and shells. Piazza Navona has three fountains with Giacomo della Porta‘s Neptune Fountain on the north end, his Fontana del Moro on the south end and Bernini‘s Fountain of Four Rivers in the middle. 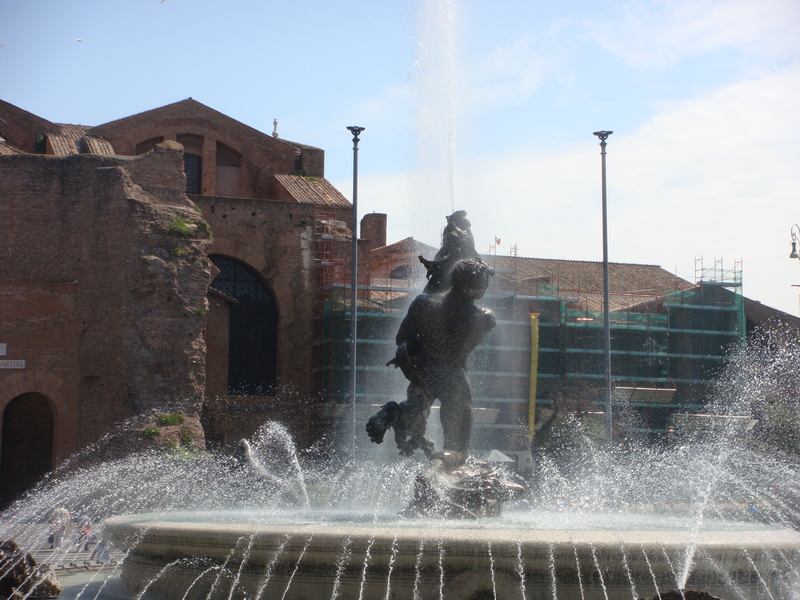 These fountains were built in a straight line along the central axis of the elliptical piazza that replicates the floor plan of the arena built by Emperor Domitian in the 1st century. It was a place for athletic competitions and races known as “Agones”. These fountains were supplied by water from the Vergine Aqueduct built by Agrippa in 19 B.C. The fountains of Rome were originally operated by gravity. The source of water from the aqueducts had to be higher than the fountain itself to create a dramatic water feature. The difference in elevation and distance between the water-source and the fountain determined how high the fountain could shoot water. Today, they use gravity as well as mechanical pumps. Some fountains have powerful water sprays and others do not. 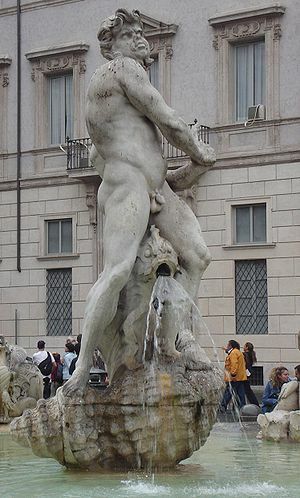 Bernini’s Triton Fountain spray reaches 16 feet above the conch shell of his Triton in Piazza Barberini but the Boat Fountain by the Spanish Steps and the Pantheon’s Fountain have very little water pressure. 1. 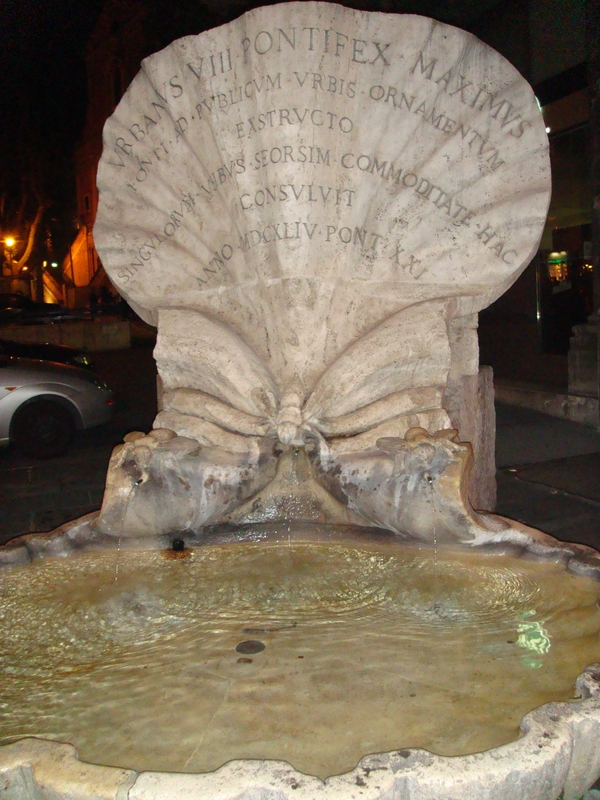 The Fountain of the Naiads “Fontana delle Naiadi” is one of the most beautiful fountains in Rome. It is located in front of the church of Santa Maria degli Angeli (St. Mary of the Angels). The fountain is surrounded by four bronze nymphs embracing sea monsters. There are three tritons, a dolphin and an octapus in the center of the fountain. It was created by the sculptor Mario Rutelli to adorn the Piazza della Repubblica in 1901. 2. 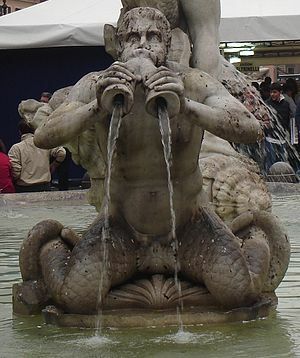 Bernini’s Fountain of the Triton is located in Piazza Barberini. It was created in 1642. The muscular Triton is held up by four dolphins and is blowing into a sea-shell. 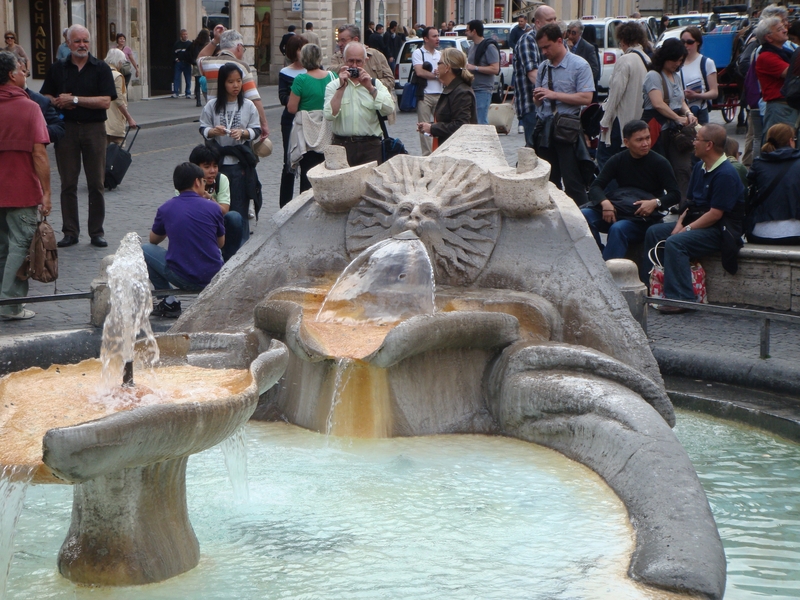 After you admire the two Bernini Fountains in this square, stroll down Via Venato. 3. 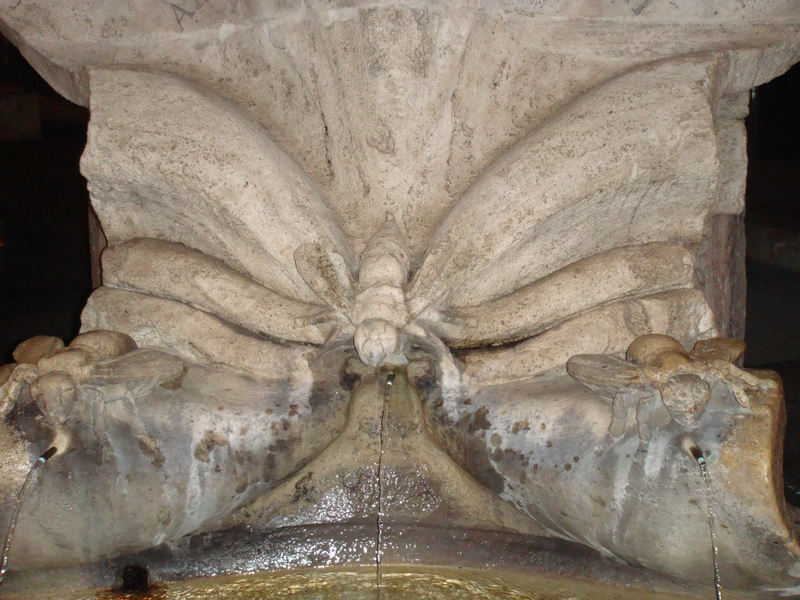 In close proximity to the Triton Fountain, you can find Bernini’s Fountain of the Bees with three bees on a shell sculpted in 1644. 4. 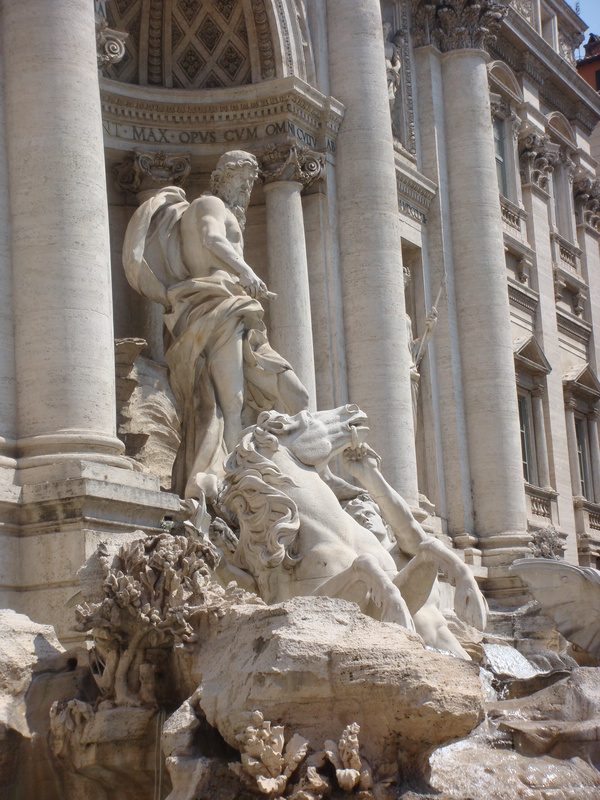 The spectacular Trevi Fountain is located on Via della Stamperia and was designed by Nicola Salvi. 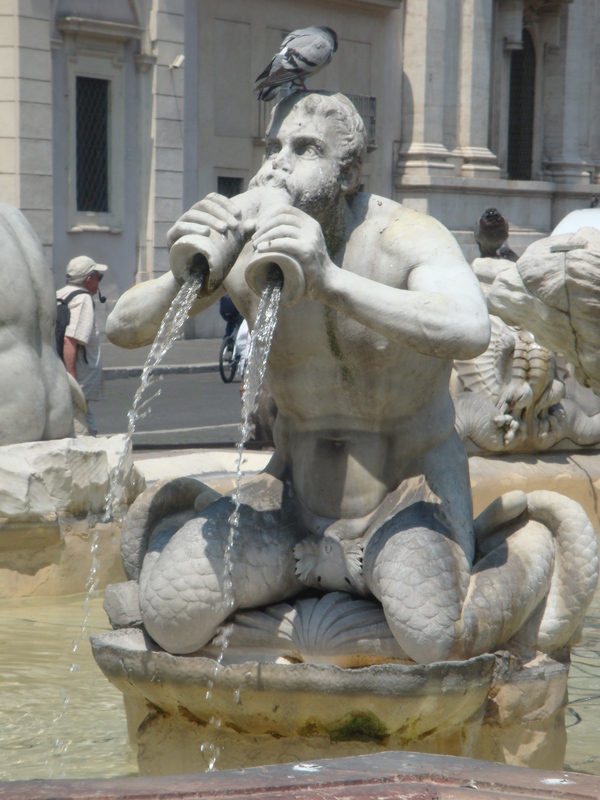 It was completed between 1732 and 1762 and is the largest Baroque fountain in Rome. The central figure is Oceanus and he is the personification of all the worldly bodies of water. He is riding an cockleshell chariot pulled by sea-horses, surrounded by Tritons and Sea Nymphs. Visit the beautiful church of Saints Vincenzo E Anastasio in the Piazza across from the Trevi Fountain. Find Agrippa approving his aquaduct blueprints in his dapper Roman military uniform in one of the niches in the Trevi Fountain. The niches convey significant historical messages in this fountain. 5. 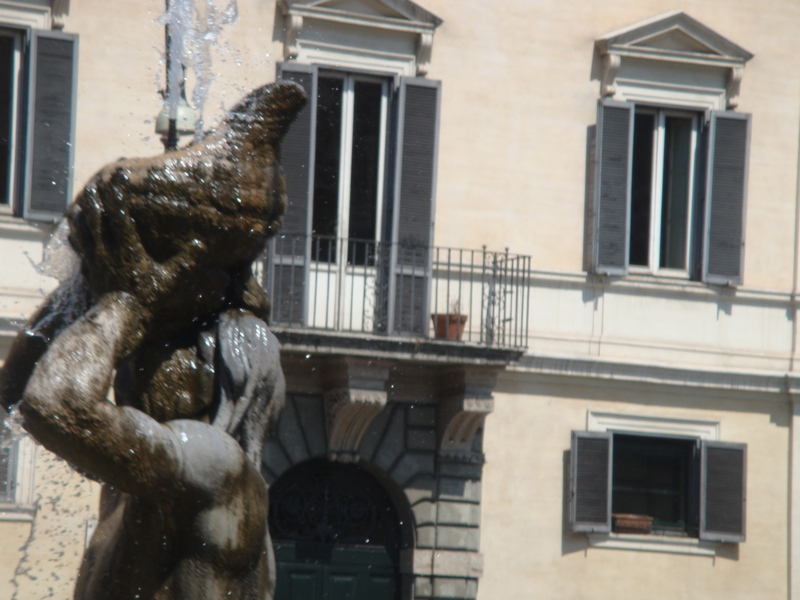 The Fontana della Barcaccia was the work of Pietro Bernini with the help of his talented son Gian Lorenzo Bernini. It looks like a submerged boat and was commissioned by Pope Urban VII Barberini around 1629 to commemorate a boat that was stranded in the square in the flood of 1598. 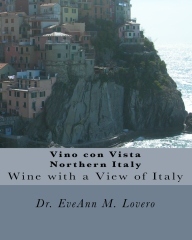 It is located at the foot of the Spanish Steps below the church of Trinita dei Monti. 6. The Piazza del Popolo has two fountains. I like the interesting Fontana dell’ Obelisco with a group of four mini lion fountains around the base. Each lion is situated on a stepped plinth that was added around the base of the obelisk in 1818. 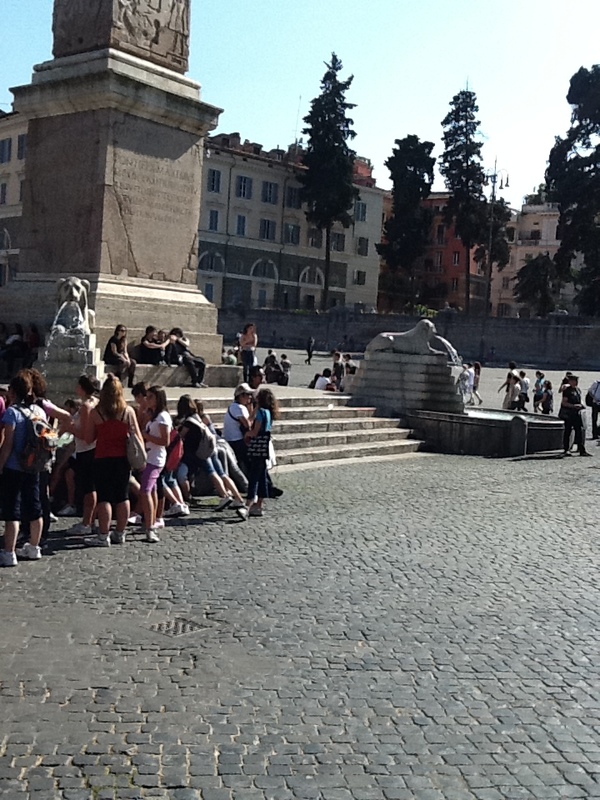 The other fountain in the square is at the base of the stairs that lead to Villa Borghese. 7. 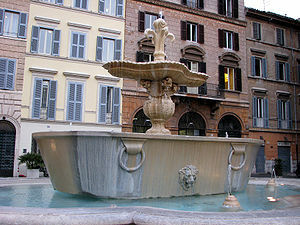 The Fountain of the Moor is also known as La Fontana del Moro. It is located on the southern end of Piazza Navona with a figure of an African (a Moor) wrestling with a dolphin http://www.youtube.com/my_videos_edit?ns=1&video_id=Bk7Sb1eVp5I&next=%2Fmy_videos. 8. The Fountain of Neptune in Piazza Navona was built in 1572 and shows the God of the Sea using his trident to commandeer an unruly octopus. He is surrounded by cheribs, tritons, sea horses and mermaids. Have a Vino con Vista @ Caffe Nettuno in Piazza Navona. 9. Bernini’s sumptuous Fountain of the Four Rivers in Piazza Navona http://www.youtube.com/watch?v=5ZzmcRZ9GyM is also known as Fontana dei Quattro Fiumi. It was built between 1648 and 1651. 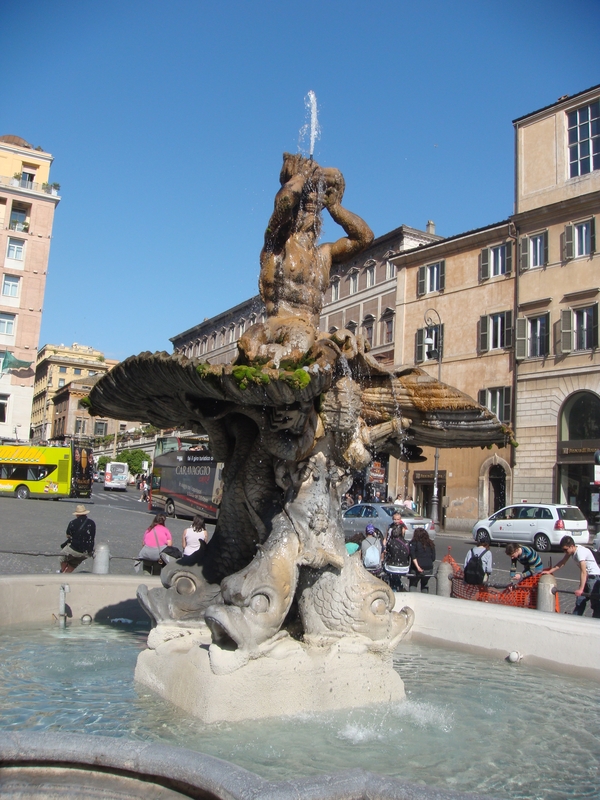 Bernini increased the strength of the jets of water for the fountain to increase the water pressure. His statues represent rivers from the four continents; the Nile, Danube, Plate River and Ganges. The structure supports a 54-foot Egyptian “Obelisk of Domitian” that is surmounted by a the emblem of the Pamphili famiy dove that represents Pope Innocent X Pamphili. 10. 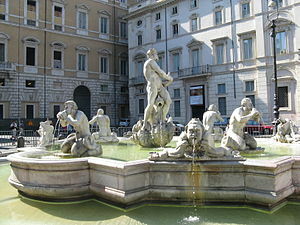 The Quattro Fontane (the Four Fountains) is a group of four Late Renaissance fountains located at the intersection of Via delle Quattro Fontane and Via del Quirinale in Rome. 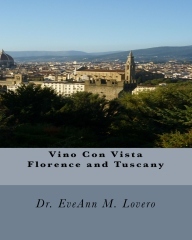 They were commissioned by Pope Sixtus V and built by Muzio Mattei. They were built between 1588 and 1593. 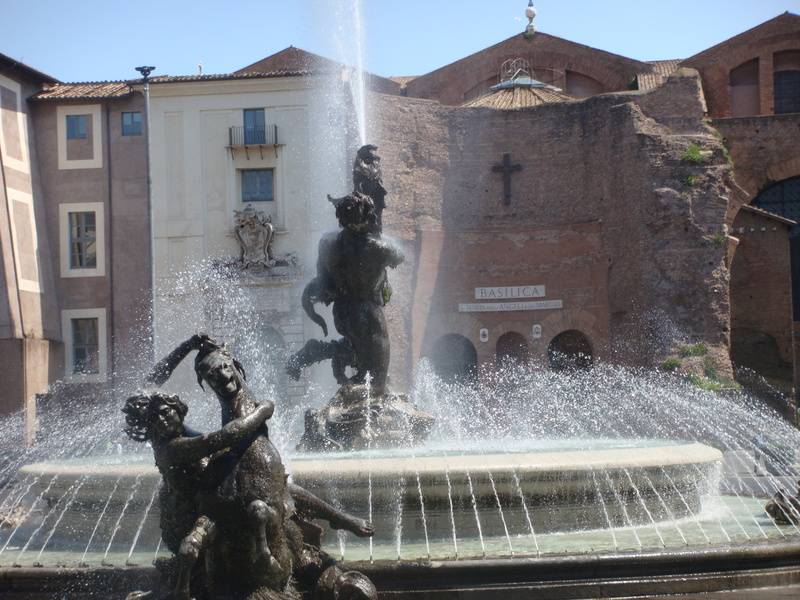 The figures of the four fountains represent the River Tiber (the symbol of Rome); the River Arno the symbol of Florence; the Goddess Diana; the symbol of Chastity; and the Goddess Juno, the symbol of Strength. The fountains of the Arno, Tiber, and Juno are the work of Domenico Fontana. The fountain of Diana was designed by the painter and architect Pietro da Cortona. The later Baroque church of San Carlo alle Quattro Fontane by Francesco Borromini is located around the corner from the fountains. 11. 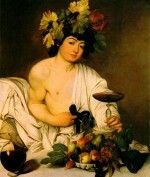 Il Babuino or “The Baboon Fountain” portrays a reclining Silenus. This mythological Roman character is half man and half goat. This is one of the talking statues of Rome, Italy. 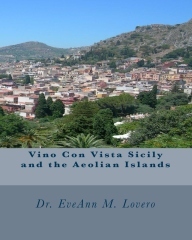 It is located on Via Babuino next to the Chiesa di S. Atanasio dei Greci. 12. The vicinity around the Pantheon Fountain http://www.youtube.com/watch?v=yQw95wqHJ34 and Piazza Navona‘s fountains offer the best Vino con Vista opportunities in town. The Pantheon Fountain was commissioned by Pope Gregory XIII and is located in the Piazza della Rotonda in Rome. It is located directly in front of the Roman Pantheon. It was designed by Giacomo Della Porta in 1575 and sculpted out of marble by Leonardo Sormani. 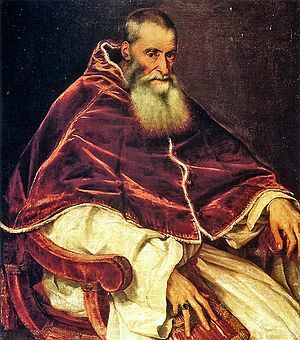 In 1711, Pope Clement XI had fountain modified. Filippo Barignoni designed a new layout and added the obelisk of Ramses II. Four dolphins decorate the base of the obelisk. The area around the Pantheon is loaded with excellent restaurants, some of them are Michelin rated http://www.youtube.com/watch?v=YE95_YgbcgY. In addition, I love the interesting cast of characters that supports the obelisk in front of the Pantheon. 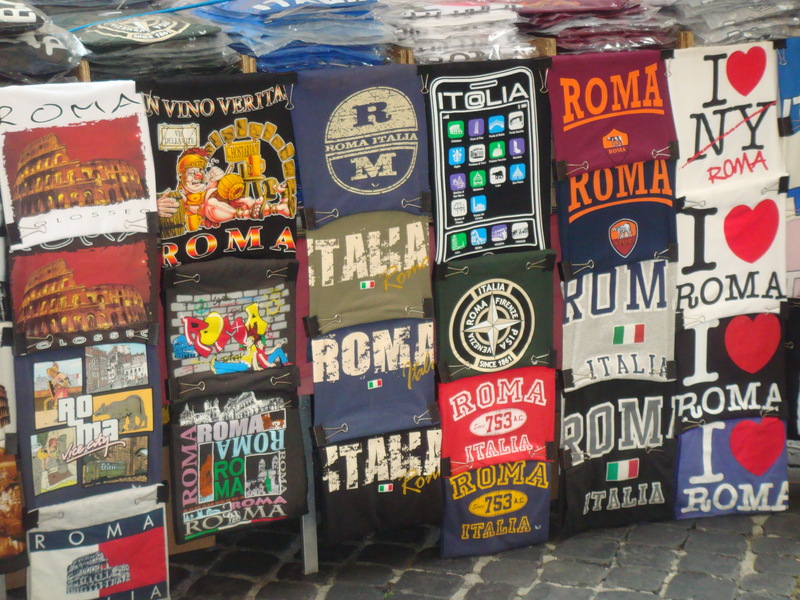 The cafe scene, restaurants and nightlife in Rome can’t be beat! 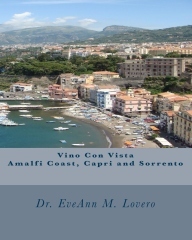 Dr. EveAnn Lovero writes Italy Travel Guides @ www.vino-con-vista.com. Friend us on Facebook and follow us on Twitter for daily blog updates.